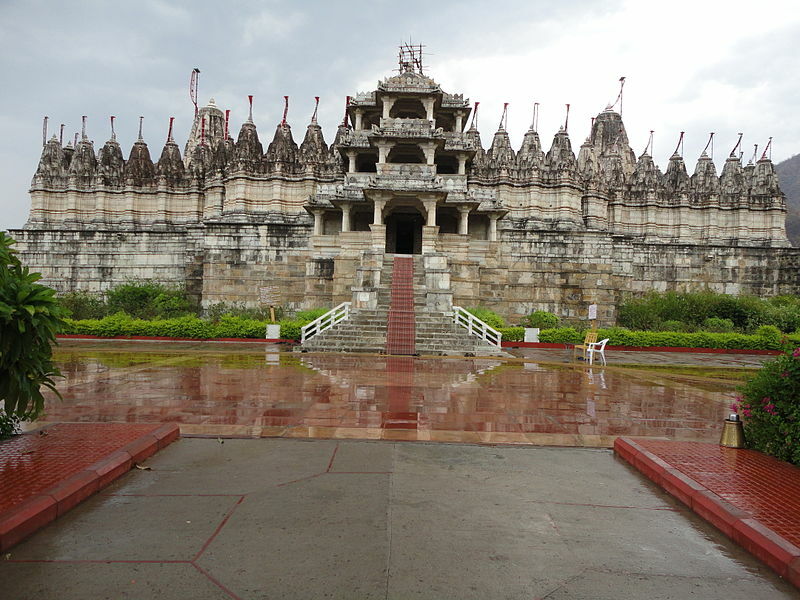 Ranakpur is named after Rana Kumbha. Once, Dharna Sah came to him asking for a land to construct a Jain temple, which he had dreamt of. 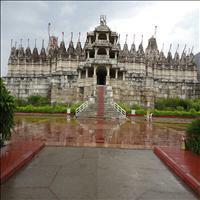 The same temple is today is famous for its marvelous carvings in amber stone and has become one of the five holy places of the Jain community. 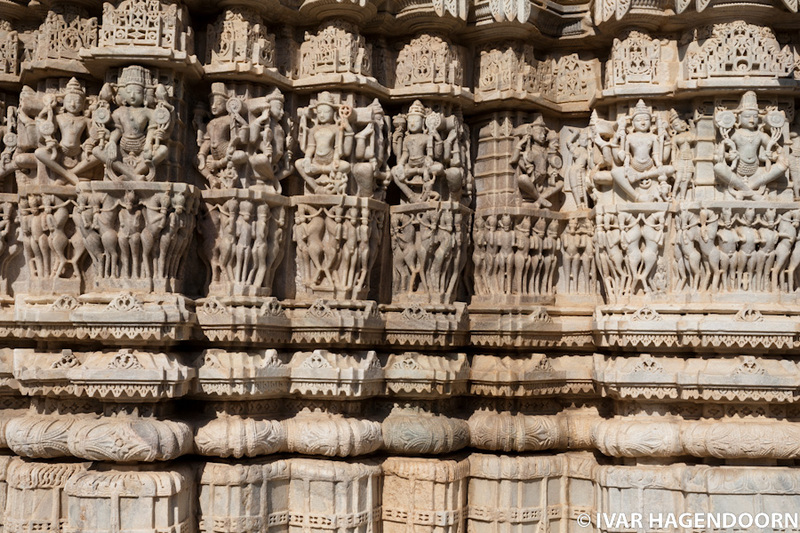 These temples constructed in 1739 A.D. are exceptionally beautiful. 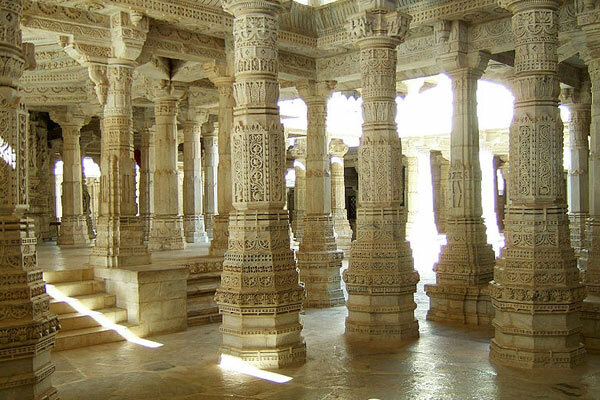 Ranakpur is situated in a remote valley of the Aravali range of hills around 60 kms. North of Udaipur in Pali district. 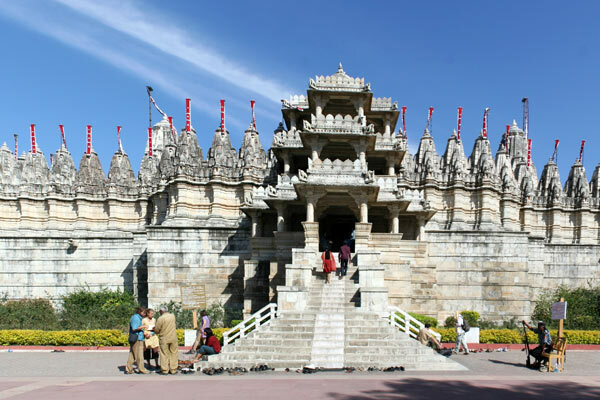 This small town boasts of one of the largest and most important Jain temples in the country. The place is well connected through a road network to other places in the region. 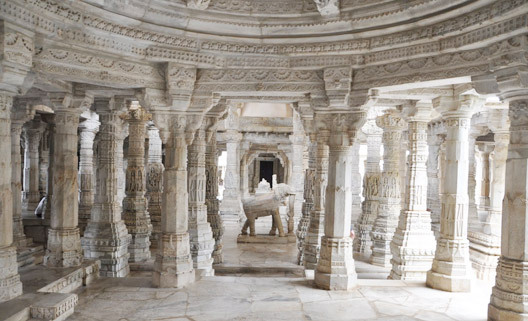 Ranakpur has an exceptionally beautiful temple complex in the Aravali ranges. 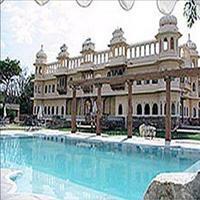 Around eight kms away is Sadri, which also has temples and an old dargah of Khudabaksh baba. 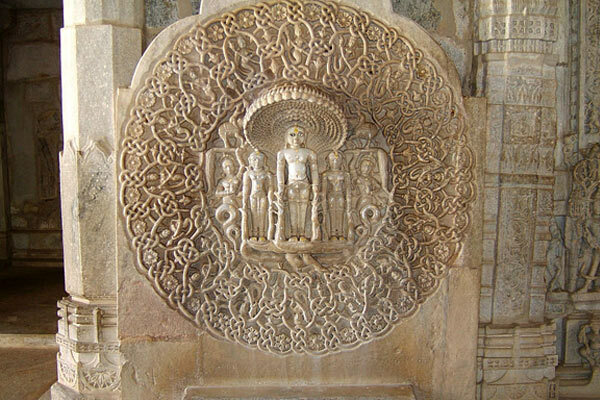 The Varaha-avatar temple and the Chintamani temples are supposed to be the oldest ones.The Jain temples were built during the reign of the liberal and gifted Rajput monarch Rana Kumbha in the 15th century. There are four subsidiary shrines, twenty four pillared halls and domes, supported by over four hundred coloumns. The total number of coloumns is 1,444 and all of them are intricately cared with none of them being alike. There nymphs playing flutes and various dance postures on these 45 feet high coloumns. The assembly hall has two big bells weighing nearly 108 kilograms, their sound echoes in the entire complex. The main temple is the Chaumukh or the four faced temple dedicated to Adinath.The artistic sculptures lie like scattered jewels. The myriad ornate 'torans' or festoons with minute and delicate carvings are a delight to see. There are innumerable elegant and lofty pillars and a large number of shikhars or spires which make a unique pattern in the face of the sky. The temple has four artistic entrances. 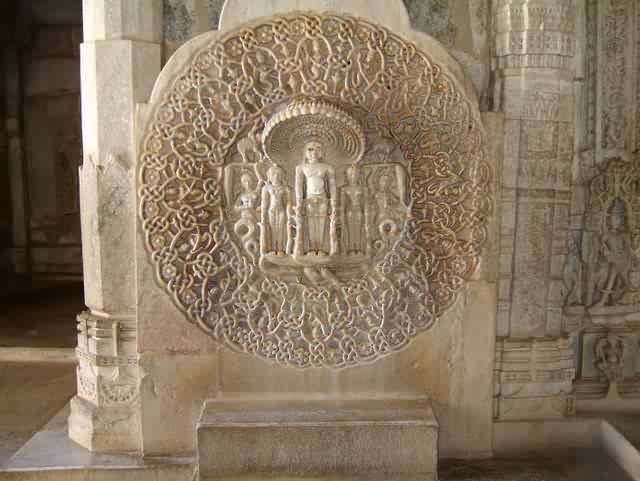 In the main chamber of the temple are four huge white marble idols of the Jain Tirthankar or revealer of truth Shri Adinath. These 72 inches tall idols face four directions. Because of these images facing four directions, the temple acquired the name of Chaturmukh temple. On the second and third floor too, there are identical Jain images. Showing India at its exotic and colorful best, Rajasthan splendors takes you through some of the most popular and famous attractions of Rajasthan. Complete with all things Indian, the trip offers an opportunity to visit some of the most evocative remnants of the bygone era of Indian history. Luring the visitors with some stunning views and elaborate architecture, the palaces and havelis give you a feel of how the monarchy once lived in all its glory. There is the enchanting Udaipur in the itinerary that is sure to add some beautiful memories to your trip with its intricate temples, beautiful gardens, grand old palaces overlooking shimmering lakes and the famous museum that contains many royal heirlooms and other memorabilia. Dip yourself into the fascinating culture and vibrancy of the colors of Rajasthan with this exotic voyage that is going to just steal your breath away with its aura and glory. Experience the royal flavors and culture of the medieval lands of Rajasthan through its majestic forts and ornamental palaces. Considered to be one of the most sought after tourist destinations of India, Rajasthan attracts tourists as much for its massive forts and scenic beauties as for its sumptuous regional fare that will leave your mouth watering for more. 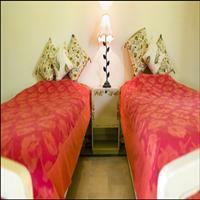 Experience the grandeur of the royal state of Rajasthan with this tour. 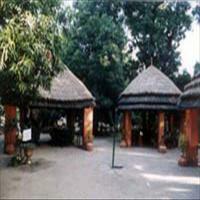 Visit some of the most famous and majestic places of the state. The magic of this vibrant place echoes in its heritage, culture, sand dunes and forts making it an unparalleled tourist destination.